Learn more about what the American Dental Association has to say about Stress and your Oral Health! What Causes Tooth Enamel Damage? Another cause of tooth enamel damage is bruxism — or teeth-grinding. 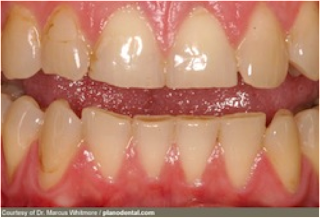 Over time, the constant clenching and friction can wear down or fracture the enamel. 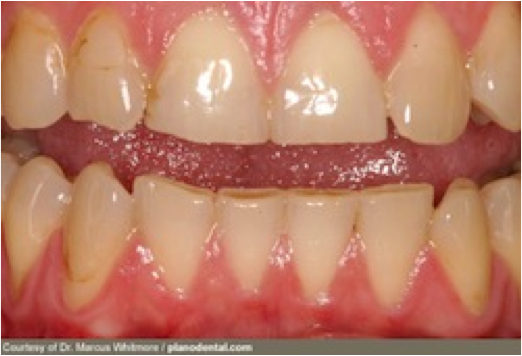 In this slide, teeth grinding has ground down the upper and lower front teeth. 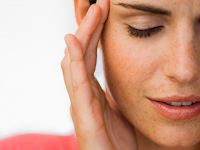 Bruxism is often worst when you sleep — that’s when you can’t control it. Reducing stress may help. Some people wear a special mouth guard to bed. A mouthguard is a flexible appliance that is worn in athletic and recreational activities to protect teeth from trauma. The dental profession unanimously supports the use of mouthguards in a variety of sports activities. Why should I wear a mouthguard? A mouthguard can prevent serious injuries such as broken teeth, jaw fractures, cerebral hemorrhage and neck injuries by helping to avoid situations where the lower jaw gets jammed into the upper jaw. Mouthguards are effective in moving soft tissue in the oral cavity away from the teeth, preventing laceration and bruising of the lips and cheeks, especially for those who wear orthodontic appliances. They may also reduce the severity and incidence of concussions. In what sports should I wear a mouthguard? Anytime there is a strong chance for contact with other participants or hard surfaces, it is advisable to wear a mouthguard. Players who participate in basketball, softball, football, wrestling, soccer, lacrosse, rugby, in-line skating and martial arts, as well as recreational sports such as skateboarding and bicycling, should wear mouthguards while competing. Why don’t kids wear mouthguards? Parents are sometimes uninformed about the level of contact and potential for serious dental injuries involved with sports in which the child participates. Some, though not all, schools reinforce the health advantage of mouthguards for their contact sports. Cost may be another consideration, although mouthguards come in a variety of price ranges. What are the different types of mouthguards? Stock mouthguard: The lowest cost option is a ready-made, stock item, which offers the least protection because the fit adjustment is limited. It may interfere with speech and breathing because this mouthguard requires that the jaw be closed to hold it in place. A stock mouthguard is not considered acceptable as a facial protective device. Mouth-formed mouthguard: There are two types of mouth-formed mouthguards. The first is a shell-liner mouthguard that is made with an acrylic material that is poured into an outer shell, where it forms a lining. When placed in an athlete’s mouth, the protector’s lining material molds to the teeth and is allowed to set. Another type is a thermoplastic, or “boil-and-bite,” mouthguard. This mouthguard is softened in hot water and then placed in the mouth and shaped around the teeth by using finger, tongue and sometimes biting pressure. Custom-made mouthguard: The best choice is a mouthguard custom-made by your dentist. It offers the best protection, fit and comfort level because it is made from a cast to fit your teeth. How should I care for a mouthguard? Clean your mouthguard by washing it with soap and cool (not hot) water. Before storing, soak your mouthguard in mouthwash. Keep your mouthguard in a well-ventilated, plastic storage box when not in use. Make sure the box has several holes so the mouthguard will dry. Heat is bad for a mouthguard, so don’t leave it in direct sunlight or in a closed automobile. Don’t bend your mouthguard when storing. Don’t handle or wear someone else’s mouthguard. Call your dentist if there are any problems.